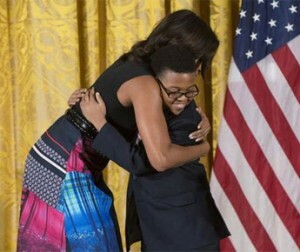 Earlier this month, First Lady Michelle Obama presented Project STEP (String Training and Education Program) student Ajani Boyd and Executive Director Mary Jaffee the 2014 National Arts and Humanities Youth Program (NAHYP ) Award on behalf of the entire Project STEP community. Project STEP received the award for its rigorous, comprehensive, year-round classical string training program for underrepresented minorities. The NAHYP Award recognizes the country’s 12 best creative youth development programs for using engagement in the arts and the humanities to increase academic achievement, graduation rates, and college enrollment. The awardees—chosen from a national pool of more than 350 nominations and 50 finalists—are also recognized for improving literacy and language abilities, communication and performance skills, and cultural awareness. First presented in 1998, the NAHYP Award is the signature program of the President’s Committee on the Arts and the Humanities (PCAH). The awards are presented annually in partnership with the National Endowment for the Arts (NEA), the National Endowment for the Humanities (NEH), and the Institute of Museum and Library Services (IMLS). Project STEP seeks to increase diversity in professional classical music by tooling students, primarily from underrepresented groups, to compete and excel in that realm. So, nearly every Saturday during the school year, Project STEP brings several dozen students, mostly Black and Latino, to Boston’s august Symphony Hall. Toting violins, violas, cellos, and double basses, these students have arrived for lessons with some of the best classical musicians in the Boston area. Throughout this extraordinary 12-year-long program, these young musicians will receive what has been called a “world-class arts learning opportunity,” one designed to change the course of these young people’s lives, while changing the classical music industry.